Add keywords for the quick add form (appearing at the top of your sequences). However, we advise you to use the complete "AI" module (artificial intelligence) available in the upper bar of BOTNATION's general menu. To a greater extent, the "AI" module provides a complete view of all the keywords and phrases used by your chatbot' sequences. This module allows to add, delete and search for keywords and phrases, including those not obtained by importing lists. In this section, you will also benefit from the "Recommendation Engine" tool. It dynamically suggests expressions applied by users of your chatbot that do not generate any programmed action. This handy tool will allow you to obtain an even more efficient bot, using artificial intelligence to intuitively understand exactly what users really expect from it! What kind of keywords should be included? 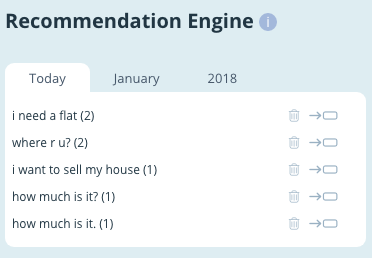 For example, if you are looking to display to users of your bot a couple of real estate ads focusing on the South of France, you can include such keywords as "Provence" or "Marseille". Any request containing something like, "I'm looking for a house in Marseille", or "Hi, do you have a house for sale in Marseille? ", thanks to this tool, will automatically be pointed to your associated sequence. That's because the algorithm reacts to the presence of a very specific word, like "Marseille", in the application for the user. Our algorithms are so smart that they also handle typing errors! You must be aware that such errors are commonplace among mobile phone users. There is no need for you to integrate them by yourself into your chatbot. In real time, BOTNATION's algorithm automatically corrects detected spelling errors, without you having to do anything, nor adding any keywords containing these errors. This tool will save you a lot of time, by sparing you the painstaking task of entering numerous keywords! Don't worry about typographic breakage: whether your keywords and expressions are in capitals or in lowercase, the algorithm will treat them either way. What do we mean by an "expression"? It's a "super keyword"... a keyword with some powers! For example, if I’d like to make the difference between a rental in Marseille, and a rental in Paris, it will be impossible to include the keyword "rental" individually in two distinct groups, therefore this is where expressions come along. In the group regarding rentals in Paris, your can include expressions like "Paris Rental" or "Rent Paris". And the same goes for Marseille, with such expressions as "Marseille rental" or "Rent Marseille". "I'm looking for a summer rental in Paris"
"Do you have a rental apartment in Paris now?" "I would like to rent a studio in the center of Paris"
Furthermore, our smart automatic system also manages misspellings associated with each expression. You will soon realize how BOTNATION’s expressions allow to create an extremely powerful chatbot within minutes! Let’s imagine that you’d like to promote real estate offers in the south of France, EXCEPT for those in Nice... because you’ve sold exclusively your entire Nice property market to one of your franchisees. All you have to do is simply add a minus symbol to the keyword you’d like to exclude from the expression, and the algorithm will read "This expression EXCEPT this". For example, "House -Nice" will point to everything which concerns a house, unless it is located in Nice. This really cool twist is an exclusive make of BOTNATION, allowing to delete a parasite keyword in such a simple manner from a group! Using this tip will considerably improves the user experience of your chatbot, as well as save you countless hours of work. In order to get familiar with the expectations of your users, BOTNATION’ machine learning algorithm learns each time you use your chatbot. If you have two groups containing only the expression "Rental Paris" as well as "Rental Marseille", but a user has searched with the keyword "Rental", our algorithm will send it to the most popular group which contains as least "Rental" in an expression, to avoid sending this user a default message such as "I did not understand your request". To delete a keyword or an expression, click on the small "X" icon located at the right. To delete an entire group of keywords or an entire group of expressions, click on the trash icon located at the top left of the tool bar. An alert box will open and ask you to confirm the deletion action. Equipped with Artificial Intelligence (AI), BOTNATION’s algorithm analyzes in real time the keywords and expressions for which your chatbot does not answer. The system is automatically triggering default message. We advise you to regularly take the time to manage the recommendations based on what comes back in conversations. By uploading these recommendations in a regular basis, your chatbot will quickly become more efficient and ergonomic! Click on the arrow to send the recommended keyword or expression to a group, or to the trash bin to delete it. The recommendation engine is an essential tool for better understanding users, prospects and customers. You can obtain a daily, monthly or yearly report of recommendations activity. Avoid words which are too generic in a group of keywords, because these words will attract all the associated traffic. For example, if you include the keyword "House" in the group "Real Estate in Paris", and the keyword "House Marseille" in the group "Real Estate in Provence", the keyword "House" alone may grasp all the traffic, as well as in a request like "I’m looking for a small house in Paris" or "I would like a large house in Marseille". It is more effective to use only detailed expressions like "House Paris" and "House Marseille", and a third group containing negative expressions, like "House -Paris" and "House -Marseille". Such expressions will answer in all instances of more generic requests containing only the word "House", as well as the words "House Nantes", "House Nancy", etc.